Sears Holdings Corp. is preparing to test a new retail concept focusing on appliances, mattresses and other home products as part of its turnaround strategy, but industry experts are skeptical that the initiative will be enough to return the company to profitability. The new stores, called "Sears Home & Life," will be much smaller than Sears' other formats and will cover areas of about 10,000 square feet to 15,000 square feet. The first three test stores, set to open in May, will be located in Anchorage, Alaska; Lafayette, La. ; and Overland Park, Kan. The stores will also offer appliance repair services and expert consultation. In its prime, Sears was a household name for a wide range of home products and appliances from major manufacturers including Whirlpool Corp., but experts are concerned Sears' latest effort might be too late and hard to build out to any scale. It could also face potential challenges from vendors reluctant to work with the troubled chain. The department store chain narrowly escaped liquidation when U.S. bankruptcy court approved a $5.2 billion acquisition bid from ESL Investments Inc., a hedge fund owned by Sears Chairman and former CEO Eddie Lampert. The retailer originally filed for bankruptcy Oct.15, 2018. Former CEO of Sears Canada Mark Cohen, who has long been an outspoken critic of Lampert, said the new home stores fail to convince him. "After 13 years of serial decline in traffic ... margins, customer affiliation and reputation, I really don’t see how this new strategy is going to resurrect the business," said Cohen, who is currently director of retail studies at Columbia University, in an interview. Cohen added that he believes the company is still heading for eventual liquidation. "They may do business in these smaller stores but this is certainly not in my mind any pathway toward a turnaround or a recovery." Sears did not respond to S&P Global Market Intelligence's requests for comment. D.A. Davidson's research director Gil Luria said Sears' focus on appliances, a category that has experienced less disruption from e-commerce compared to other categories such as apparel, makes him optimistic that the concept will be successful but not enough to shoulder Sears' overall business. "As a concept, it seems promising because Sears is good at those particular categories and because it's a category that lends itself to brick and mortar," Luria said in an interview. "The contribution of growth from the smaller footprint stores is unlikely to be enough to offset the decline in the large format stores," Luria said. "It may be too little too late even if the format is somewhat successful; they're still dealing in a tough retail environment." Alex Arnold, managing director at Equity Research at Odeon Capital Group LLC., also voiced concern about Sears' ability to scale the format. "It's definitely worth working toward and it can probably create some value but ... I don't know if they can do it without significant additional capital finding its way into the balance sheet," he said. "You're basically building out a new chain. Whether you're taking the existing square footage and retooling it or you're opening up brand new spaces, it's expensive," Arnold said in an interview. The struggling retailer is also incorporating a "search bar kiosk" in its stores where customers can purchase other items online. But other big-box retailers already have a head start on the buy online, pick up in store option. 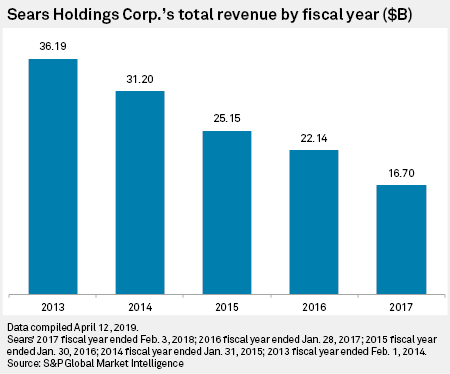 "The retailers that have survived the last few years and the last couple of decades are the ones that have been able to create a compelling direct-to-consumer channel and it may be a little late in the game for Sears to go that path," Luria said. Sears' annual revenue from home appliances dropped to $2.67 billion in 2017 from $3.32 billion in 2016 and $3.77 billion in 2015. The retailer's total revenue also dropped to $16.70 billion in 2017 from $22.14 billion in 2016 and $25.15 billion in 2015, according to the company's annual reports. The reports only disclosed sales of appliances as a percentage of overall sales. 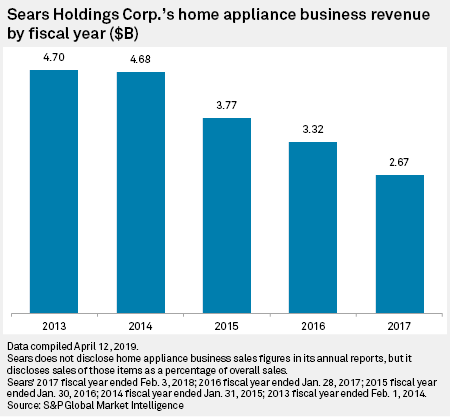 The revenue from appliances was calculated by S&P Global Market Intelligence using the figures included in Sears' annual reports. Luria said the home stores might face a similar fate as other successful ideas such as Discover Financial Services and The Allstate Corp. that originated within Sears and were eventually spun into independent businesses. "Any company [where] the big business is declining and there's [an] emerging growth business, there’s going to be a lot of pressure on the holder or by the holder to spin it off," Luria said. However, he added that it's worth noting that the home and life stores, unlike Discover and Allstate Corporation, is leveraging the Sears name brand which might make a spinoff a little bit harder. Arnold and Luria believe there is still value in the Sears brand, particularly in the appliances category, although it has been highly diminished over the last several years. According to Arnold, retailers such as Home Depot Inc. and Lowe's Cos. Inc., have taken Sears' share in the appliance market over the last decade. In the last round of earnings, both Home Depot said Lowe's executives said comparable sales in the appliances category was above the company's average for the fourth quarter of 2018. "They have lost their core base and the less base you have the less you have to leverage but the brand I think stands the test of time. It's just tarnished right now," Arnold said. He added that introducing initiatives like these new stores might help boost the brand's reputation among customers. Cohen, on the other hand, is not convinced that customers will revive their trust in Sears. "If you're an appliance customer, why would you trust Sears to deliver, install and service a major purchase when in fact in the last 10-plus years their performance in that regard has been slipping?" Cohen asked. Cohen is also concerned that Sears' financial challenges have given the retailer a poor reputation within the vendor community and expects vendors to be "extraordinarily cautious," which may affect the retailer's ability to source compelling inventory. "It remains to be seen whether this new company … is going to get any support from the vendor community," Cohen said. While experts question Sears' chances of reviving itself through this new retail strategy, they also said that the retailer does not have many other options to stay afloat. "They don't have a lot of choice. It's either that or shut the whole thing down," Luria said.